THE DEVICE is an extremely portable illusion that fits in your pocket. The magician explains to his audience how he got accepted into the secret association of magicians: it was through a rather unusual mail-order test. He removes a small device from his pocket and unfolds it into a box. Shoving pencils through every possible angle, he says figuring out where they go is the first step. One-by-one, six sharpened pencils are jabbed through the box, mysteriously or painfully penetrating the magician's arm. With each pencil, he demonstrates his resolve at becoming a magician. After the last improbable pencil is inserted, he reveals that he passed the test. The pencils are removed and his arm is shown to be unharmed. THE DEVICE includes a twelve-page comic-book style booklet filled with photos. It's simple to construct (it only take a few minutes) and comes with material to make two as well as a downloadable template. You'll need to supply pencils and glue. What is THE DEVICE made out of? Card stock, glue and moxie. The preferred presentation is on stage. It looks much stronger from one side than another - however, it's extremely baffling from every angle you look at. If it's just paper, what exactly am I buying? So is the Constitution of the United States of America!!! Anyway, this is thick card stock. What you're buying is the instructions, script, materials and template for a very entertaining, delightful little illusion that fits in just your pocket. Is this like "Candle Through Arm"? That effect was a big inspiration. 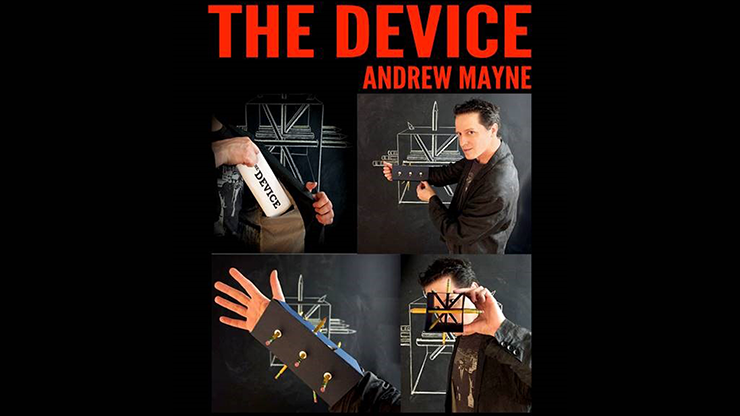 Andrew Mayne always wanted to create something similar, but even more painful looking. What if my arm is too skinny, manly or short? You can adjust the size of THE DEVICE. Andrew Mayne includes materials for two so you can see if it aligns right for you. You can make your own based on the principle behind the effect. It's really not that hard.